It is possible to assign members to different user groups. 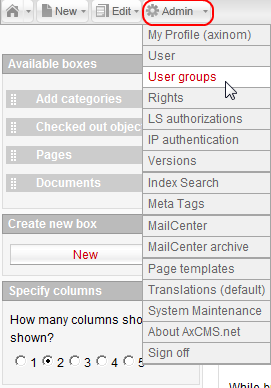 Select Admin –> User groups OR Edit -> User Groups and click the New button in the Tools section. You will be directed to user groups overview page. Here all the user groups of members are displayed as a list. Please note that some buttons, functions and data appear only after saving. 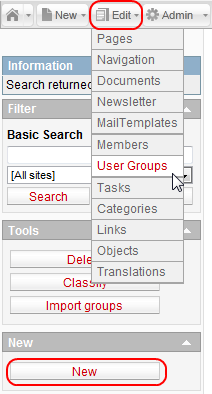 With extendable search for filtering user groups by several categories. With Delete button for deleting user groups, Classify button for attaching categories or navigations to user groups, and Import Groups button for importing existing user groups from an .xml file. For creating a new user group. For exporting data of the selected user groups(s) to an .xml or .csv file. The Group textbox allows you to enter or change the name of the user group. You can assign categories to user group here. Contains a text field for adding a comment. The name of the user group is displayed in this textbox. You can change it any time. The unique ID of the user group. GUID of the user group (Globally Unique Identifier). Date and time of the activation/reactivation of the user group. 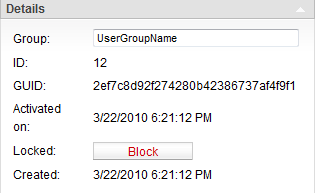 Enables you to block/lift block for the current user group. Date and time of the user group creation. You can attach user group to a navigation point here. You can add and edit tasks for the current user group here. 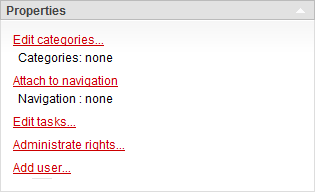 Here you can manage the rights for the current user group. Please note that the rights that are given or removed from a user group automatically affect all the members of this user group. You can add members to the current user group with this function. 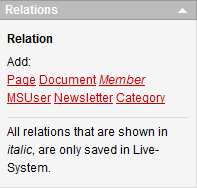 You can set relations for the current user group in this section. Please note that relations added to the user group will affect all the members of this user group.